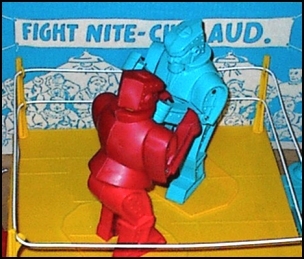 and the punching of the robots were directed by controllers on either side of the ring. The 'bots could move forward and from side to side while throwing left and right jabs. Connect just right with your opponent's jaw and his head literally fly off of his shoulders. Snap it back down and you are ready for another round! would come whizzing up, to the delight of the child on the other side of the ring. the original box, the score cards, ring posts and ropes are often missing. Also, the "Glass Jaw" syndrome seems to worsen with time. The Blue Bomber versus the Red Rocker jar more childhood memories than Ali versus Fraizer. plastic she may have happily sacrificed a dish or two for some peace and quiet!